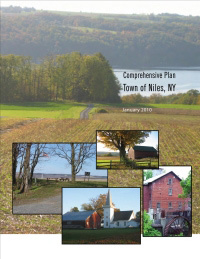 The Community Development and Comprehensive Planning Program works together with communities across the Central New York Region to develop the guiding plans for growing and strengthening our interconnected local economies while preserving our natural and cultural heritage. A regional perspective on community development and planning addresses the inter-relationships of our communities, and helps to foster inter-municipal collaboration in planning and development initiatives. Through Comprehensive Planning that addresses economic development, environmental management, energy conservation, and public resource investments; we work continually to introduce, and lay the groundwork for implementation of emerging best practices in community planning and design. Staff works directly with communities across the five county region in the preparation of Comprehensive Plans and community revitalization projects. Communities assisted by the CNY RPDB include the Towns of Locke, Niles, Scipio, Victory, Sandy Creek, and Richland, and the Villages of Pulaski and Phoenix. Other initiatives include the preparation of the CNY Canal Revitalization Plan, A Vision For The Skaneateles Highlands, and participation in projects of the NYS Canal Corporation and the Erie Canalway National Heritage Corridor Commission. A regional perspective on urban and rural land use and design, housing and neighborhood development, and historic preservation provides our communities with insight and tools to meet the challenges ahead.